This may come as a shock, but Americans love fast food. We love it so much that certain chains are opening palatial flagship locations with rooftop decks in major cities, and regularly unleashing new and borderline insane menu items to get us to swing by and eat more of it. We love it so much, that one in four adults in America actually eats at a fast food joint every single day. Seriously. 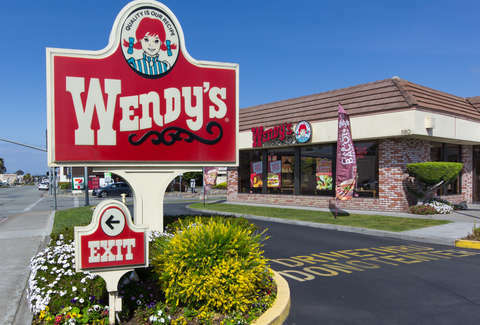 But besides interstate rest stops and mall food courts, where are you most likely to find the most Wendy's, Taco Bells, and Burger Kings around the country? 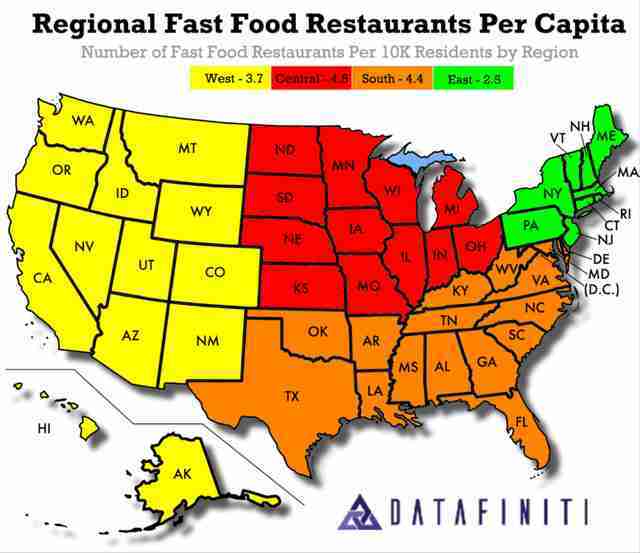 Well, the data whizzes at Datafiniti went the extra mile and figured out of the roughly 500,000 fast food joints sprinkled across America, which states are home to the most per capita. Spoiler alert: the South and Midwest are great places to be if you're jonesing for a quick drive-thru-accessible pick-me up. By consulting its extensive database of business data on fast food restaurants and their geographic locations, Datafiniti was able to determine which areas -- and, more specifically, which states -- have the highest concentration. It turns out Alabama boasts the most, with 6.3 per person, while Nebraska and West Virginia earn the number two and three spots, with 5.4 and 5.3 locations per person, respectively. If you want to know where your state landed in the ranking, check out the full list (shown below). As for how density breaks down by regions of the country, the Central US is home to the most per 10,000 people (4.5), while the South ranks number two with 4.4 joints per 10,000. Then, it's the West and East coasts taking in third and fourth, with 3.7 and 2.5 fast food establishments per as many folks. Datafiniti also looked at which restaurants have the most locations nationally. Subway sits in the number one spot, followed by McDonald's at number two and Burger King at number three. Meanwhile Taco Bell and Pizza Hut earn the number four and five spots, respectively. Interestingly, Chick-fil-A, which is reportedly on track to become the third largest chain in the country, currently sits in the No. 15 spot. Just some more intel to consider next time you're thinking about making a big move.